If the word camping evokes flashlights, heavy backpacks and bring-your-own toilet paper, “glamping” — or glamorous camping — is more like vintage oil lamps, massages at your request and in-tent bathrooms with heated floors. While the exact origins of the practice of modern-day luxury camping are unclear, it likely became popular in the UK first before spreading to other countries around the world. “When we started with 200 accommodations three years ago, the majority of those were in the US,” says Jessica Armstrong, head of public relations and partnerships at GlampingHub.com. Now, she says, Canada and Australia are two of the top leaders in their market after the countries grew exponentially over the last couple of years. Global glampsites are on the rise in countries across the globe and their amenities leave almost nothing to be desired. Here are some of our favorites. An “en-suite tent” at this British Columbia resort comes with a king-sized bed, private deck and laundry service, but the en-suite bathroom is the real star of the show. Along with spa slippers and robes, it features double sinks, a private outdoor covered shower and a heated floor. Glampers can choose between waterfront, rainforest and sunrise tents, and inside, the light selections alone spell out luxury — vintage oil lamps, candles set in antique silver and crystal and, of course, electric light. Guests have access to their own remote-controlled, propane-fueled, cast-iron wood stoves, while dishes like crab ravioli and Cornish game hen make an appearance on the resort menu. In the event guests need additional relaxation, the resort spa offers both hot stone and deep tissue massages. All-inclusive rates from $1,283–$2,005 per person per night for a three-night package. Four- and seven-night packages are also available. Image courtesy of Clayoquot Wilderness Resort. In a normal camping tent, each person is usually allotted about 15 square feet — but at Aman-i-Khas, a resort in northern India, the Mughal-inspired tents measure 1,162 square feet. Fine cotton screens separate each tent into sleeping, dressing, dining and living areas, while the tents boast fully equipped bathrooms with full-size bathtubs, air conditioning and heating, king-size beds, twin writing desks, oversized daybeds, sun decks and, of course, Wi-Fi. Each couple or family of glampers is looked after by their own personal butler, who serves food and drinks and arranges activities. The dining tent offers both Indian and Western dishes, the lounge tent is furnished with banquettes and reading tables, while the spa tent features massages and a step-well pool. For adventurous travelers, there are twice-daily guided safaris into Ranthambore National Park to view tigers, leopards, hyenas, antelopes and more than 350 known species of birds. From $1,350 per night. 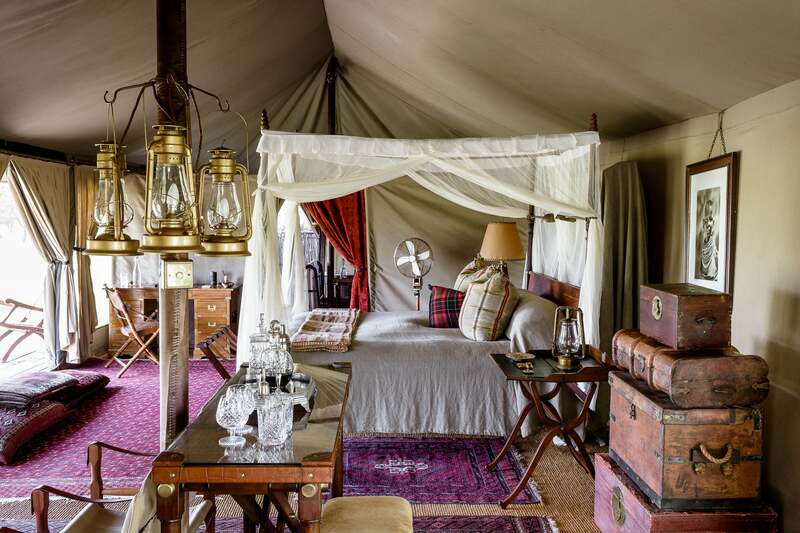 It’s a 1920s-style explorer’s camp in northern Tanzania and it’s lavish, with tents housing four-poster canopy beds, Persian rugs, Zanzibari chests and claw-foot bathtubs. Just steps from the tents are the plains, with scattered daybeds for napping and watching the local game from afar. Glampers can enjoy electricity and Wi-Fi, plus a swimming pool and a gym. The camp’s spa offers stress-relief and relaxation treatments, with massage tools made from the wood of the Mwarobaini, a medicinal Swahili tree that’s used to treat more than 40 ailments. Adventurous guests can take advantage of guided safari walks and game drives for the chance to view species like bat-eared foxes, Maasai giraffes, elephants, buffalo, cheetahs, black rhinos and zebras. Contact Singita Sabora Tented Camp for rates. This Kenyan camp is located on the site of the former home of Joy Adamson — naturalist and author of “Born Free” — and it partners with a wildlife conservancy to fundraise for the surrounding ecosystem. 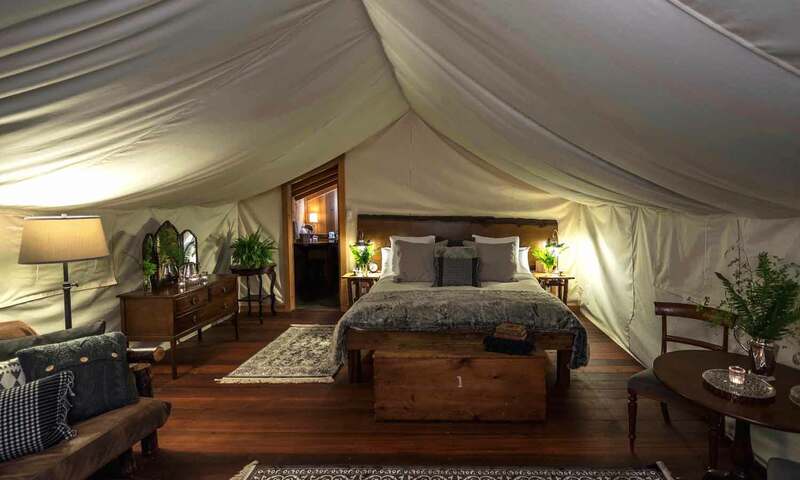 The boutique camp’s luxury tents include large main bedrooms, verandas for outdoor seating and bathrooms with stone floors and hot running water. From the camp, guests can catch glimpses of elephants, buffalos, lions and other plains animals and when guests aren’t relaxing in their tents, they can enjoy the swimming pool with bar service, massages, manicures, pedicures, painting materials, game drives, guided plains walks and picnic breakfasts. As far as meals, menus include fresh homemade breads and pastas, organic salads, Italian risottos — private romantic dinners can be arranged on request. From $270 per person per night; prices vary depending on the season. Image courtesy of Joy’s Camp Shaba. 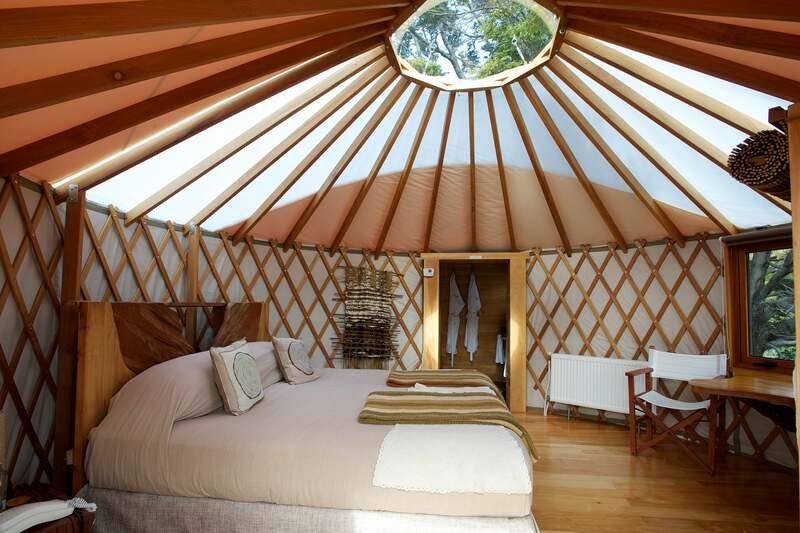 Can you say yurt suite? Besides a luxury bedroom, these Mongolian-style tents feature bathtubs and rain showers, central heating, private terraces, lounges with Nespresso machines and — here’s the kicker — outdoor hot tubs. The transparent circular dome in the center of each tent was historically used as a chimney for the Mongols’ fires, but today, guests use it to stargaze. As for views, the yurts look out onto the Cordillera Paine mountains and Lake Toro, and Wi-Fi, laundry and room service are offered to all guests. Patagonia Camp also has an on-site restaurant, bar and lounge, while the menu includes crab, salmon, lamb and locally grown vegetables. From $440 per night. Image courtesy of Patagonia Camp. Where are your favorite places around the world to go glamping? Tell us about them, below. Featured image courtesy of Singita Sabora Tented Camp.